Today, I decided to go to a new Japanese restaurant in the quaint village of West End whose name perfectly describes myself. They have another branch at Broadway and Rupert and that branch has gained quite some popularity. I believe that their location at Denman is larger and more spacious than their original location. Looking at the menu, I saw that fried items were very well represented in comparison to the other categories, and it was quite tempting for me to order only fried items. However, since that is the perfect recipe for a sore throat, I went on a mini nigiri sampling spree at the end instead. I was started off with the Kaki Fry (deep fried, breaded oysters) which contained six soft, juicy oysters. The oysters were not very large, and I found the amount of batter to be a bit disproportionate for the size of the oyster. It certainly packed a lot of crunchiness though. The sauce on the right was a sweet tangy sauce mixed with mayonnaise (the same sauce typically used for takoyaki) and was a good accompaniment for the vegetables. I also found the mysterious star symbol rather interesting - it's like "Place the oyster here and something magical will happen." The Awesome Roll consisted of crab meat, avocado, cucumber, masago, baked salmon, and some yam fries dressed with spicy mayonnaise on top. The most awesome part of it was the abundance of crunchy fries on top and the slight spiciness of the mayonnaise added dimensions to the overall flavour of the roll. The artificial crab meat was very sweet while the avocado was under-ripe, which, texture-wise, resembled an unfortunate piece of unmelted chocolate that somehow wandered its way into the mix. Otherwise, the roll was decent and mostly awesome. And at last, the results of the mini nigiri sampling spree. The Seared Toro Nigiri was dressed with a mild, savoury sauce that greatly enhanced the flavour of the toro, and the resulting rich, juicy smoothness was a delight. The Seared Salmon Belly Nigiri had the top half seared (the right way to do it) and had a sweet taste as well as a small, non-distracting dab of wasabi inside. 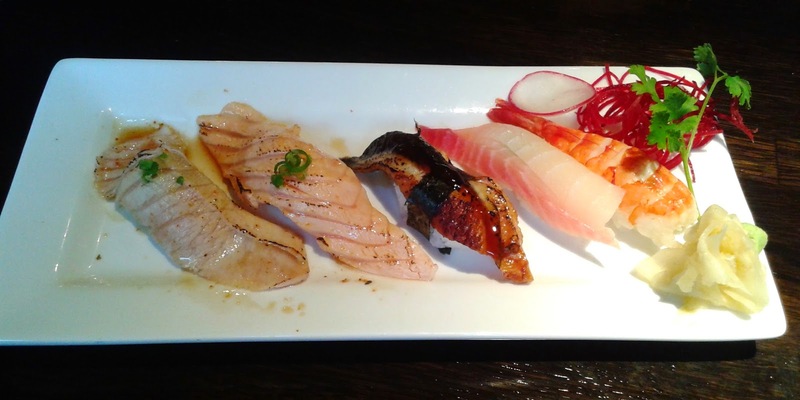 The Unagi Nigiri paled in comparison, and was not only small but also lacking in moisture. The Tai Nigiri, on the other hand, was very fresh and had a smooth texture and the perfect amount of flavour for tai. The Ebi Nigiri was a bit too chewy and was marinated with ginger. The service was adequate and was neither something to rave about nor complain about. The food was fine (it would be quite decent if a few small things were fixed) and the prices were quite reasonable. However, the washroom was not reasonable. It was so small that I had trouble cramming myself in there. Plus, I had to stand to the side in order to use the toilet because the sink was in the way (there wasn't any other place to put the sink because the washroom was so small). I'm a pretty slim guy and if I have trouble fitting myself in, something is wrong. Go to the library instead (it's just a block away) for a more comfortable washroom. That being said, Sushiholic, with an adequate variety of menu options, can be a good place for a sushiholic to satisfy his or her desires.